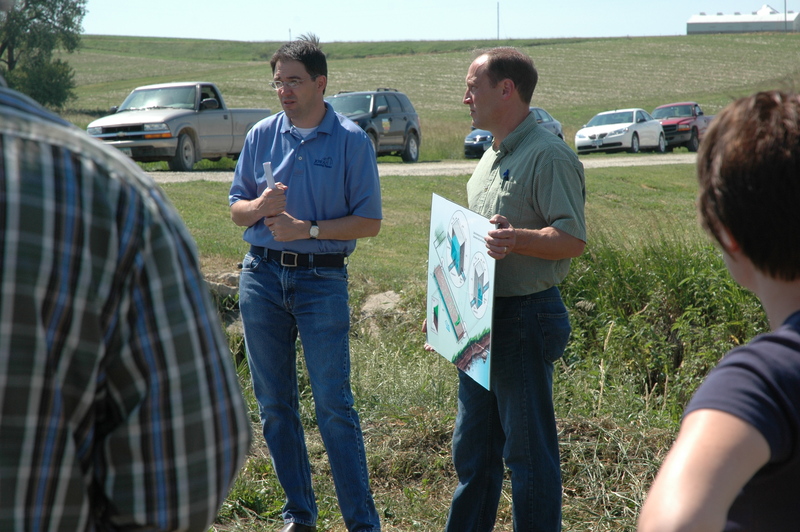 Matt Helmers, water quality engineer with Iowa State University and Iowa Learning Farms, and Chad Ingels, ISUE NE Iowa water quality projects coordinator, discuss research data from bioreactor site on the Al Wente farm. The purpose of the device — on the Hewitt Creek Watershed — is to reduce nitrates in runoff from farm fields. BANKSTON, Iowa – About 30 people took a course Friday morning informally called Woodchip Bioreactor Basics 101 on the Al Wente farm near Bankston. In August, the bioreactor was installed. There’s another one located further north on the Ernie Goebel farm near Luxemburg. The intent of installing bioreactors is to find alternative methods to reduce the impact of nitrate in runoff from fields. Chad Ingels, an Iowa State University Extension watershed specialist, explained that tile lines, which gather excess water beneath the surface of crop fields, eventually run off into the Mississippi River. Water with high counts of nitrate in Midwestern agricultural drainage also contributes to the hypoxic zone (or Dead Zone) in the Gulf of Mexico. “The purpose is basically to help reduce the nitrogen load to the stream in a simple form,” said Jeff Pape, a member of the Hewitt Watershed Committee. A woodchip bioreactor is fairly simple. On the Wente property, the bioreactor is a 12-foot-by-100-foot-long trench, 4 feet deep and filled with wood chips resting on top of the tile line and a layer of covering dirt, about 1 1/2 feet. Water from tile lines is diverted into the reactor, filtered through the chips and the microorganisms – bacteria – break down the nitrates in water and expel it as gas. Treated water flows out. A bioreactor is designed to last up to 20 years. A bioreactor’s annual nitrate load reduction can range from 10 percent to greater than 90 percent – depending on the bioreactor, the drainage system and the weather patterns for a given year. According to ISU Extension, based on research from Iowa, Illinois and Minnesota, most bioreactors show performance of about 15 to 60 percent nitrate load removed per year. It cost about $5,000 to install Wente’s bioreactor, and it drains about 70 acres.  Wente’s farm is part of the 27,000-acre Hewitt Creek Watershed. Pape said residents were made aware of an impaired waterway about seven or eight years ago. “The people in this watershed are working to reduce that and better that stream,” he said. Other discussion topics included preventing soil and stream bank erosion. Planting rye and oats in corn and soybean fields as a winter cover is gaining popularity, Pape said. The Iowa Learning Farms Lil’ Conservation Station was on display at the field day. 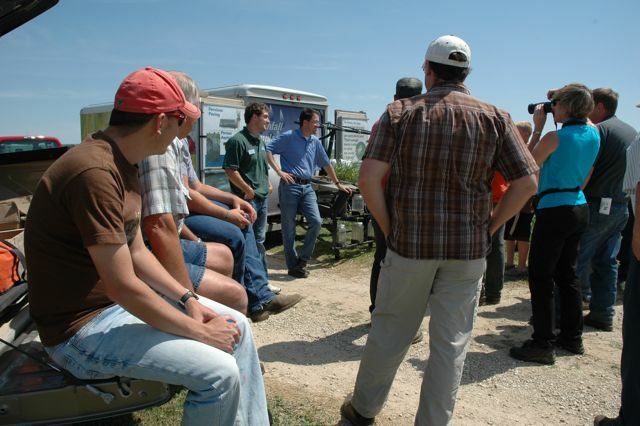 The Conservation Station is a mobile learning center that travels across the state teaching all Iowans how they can help to improve water quality and keep Iowa’s soils in place. 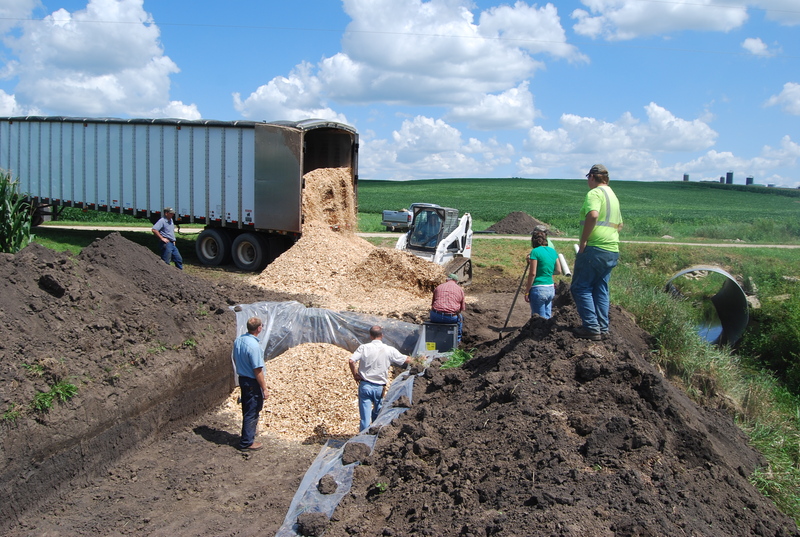 Photo of the biofilter taken in August 2011 showing the trench being filled with woodchips.